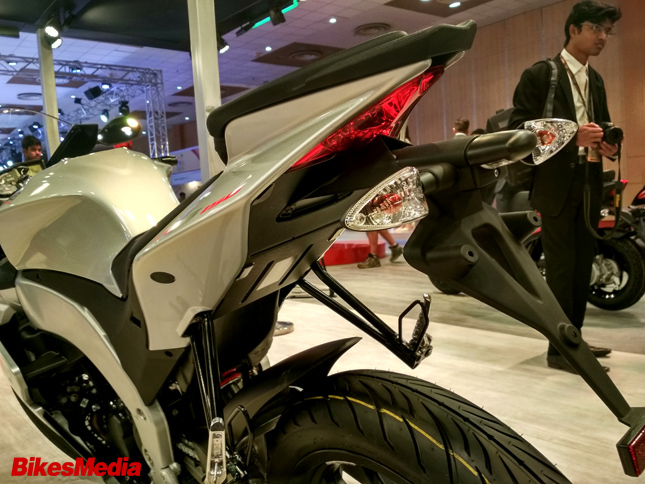 The Yamaha YZF R15 V3 was the most awaited 150cc motorcycle in the Auto Expo, but only until Aprilia unveiled bombshells in the form of Aprilia RS 150 and the naked Tuono 150. The RS 150 and Tuono 150 are perfect clones of their flagship RSV4 and Tuono V4 1100. Both the motorcycles are no less than an art form, coming from the Italian manufacturer. 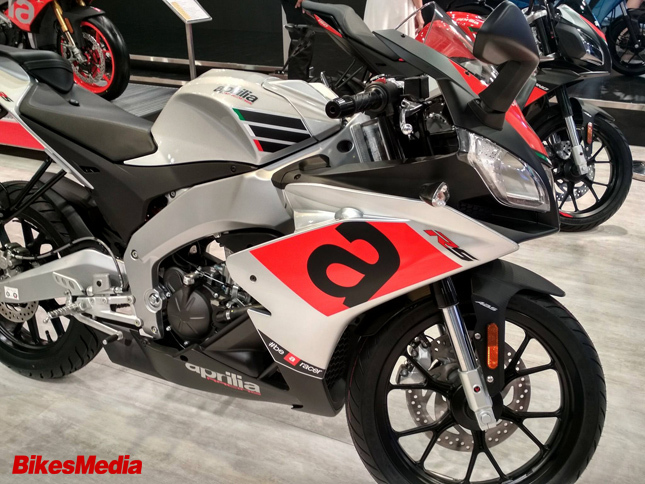 The Aprilia's are sure to give a headache to Yamaha, as the RS 150 especially looks better and has better equipment when compared to the R15 V3. 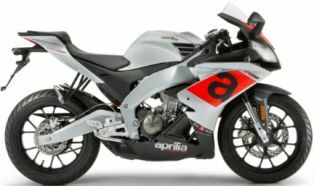 The Aprilia RS 150 looks exactly like the elder sibling, the RSV4, except for the size. The Tuono 150 doesn't completely resemble the Tuono V4 1100, as it's not only smaller in size but also has slightly different design. The curves are not as aggressive as on the Tuono V4 and is a bit subtle. The RS 150 on the other hand, is by far the best looking motorcycle at present in the 150cc category. The headlights on the RS 150 is identical to the RSV4, while the Tuono 150 has conventional lights instead of projectors like the Tuono V4. Both motorcycles are distinctive and headturners on their own way. 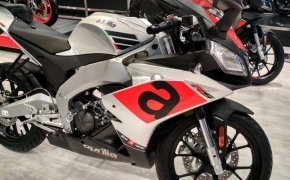 Aprilia have done a great job in incarnating a design as close to their flagship liter class motorcycles, unlike what Honda does to their CBR line up (read CBR 250R and CBR 650F). Both motorcycles feature LED taillights and a sleek rear end. Engine and Performance: Both the RS 150 and Tuono 150 share the same engine platform which is a 150cc single cylinder liquid cooled unit. The motor churns out a healthy 18 hp at 10,000 RPM and 14 Nm of torque at 7,500 RPM. The engine is BS4 compliant and is fueled by fuel injection system. 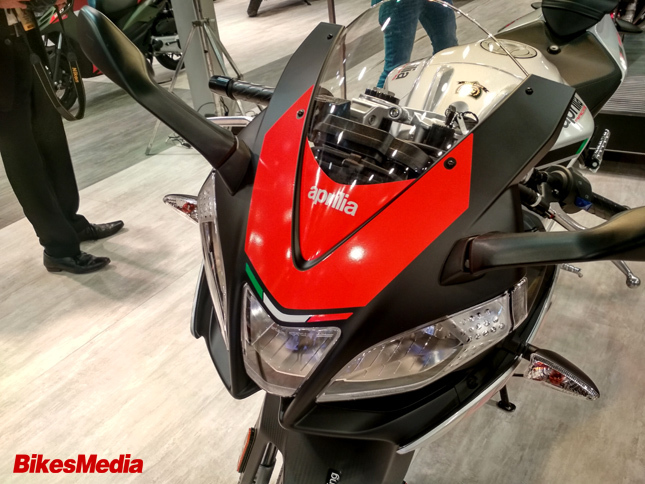 It has a 6 speed manual transmission and Aprilia is looking to offer optional Quick Shifter, again a first in class. 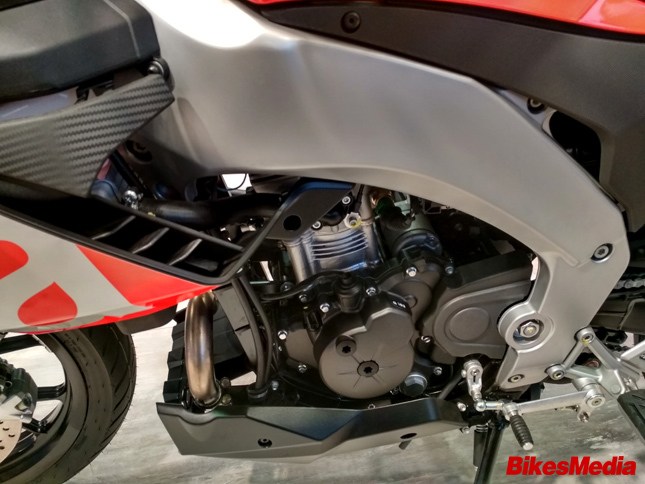 Brakes, Chassis and Suspension: The Aprilia RS 150 and Tuono 150 sits on an aluminum perimeter frame suitable for aggressive riding and utmost control. Both bikes get premium 40mm USD forks at the front and a rear mono shock linked to the aluminum swingarm. Braking duties are carried out by large 300mm hydraulic disc upfront with two piston calipers and a 218mm disc at the rear with a single piston caliper. ABS is offered as standard on both the motorcycles. The 17 inch alloy wheels are uniquely designed and comes shod with Mitas tyres (a Czech brand) of profiles 100/80-ZR17 and 130/70-ZR17 respectively. Both motorcycles get a combination of analog tachometer with a digital speedometer console along with all the telltale lights. The showcasing of Aprilia RS 150 and Tuono 150 would definitely be a throat cut to Yamaha, as most of the media attention was grabbed by the Italian marquee. If priced right, the RS 150 and Tuono 150 would take the 150cc performance bike market by a storm. The bikes have got the strong performance on paper and a strikingly beautiful design, enough to bowl over the Indian buyers, it is expected to be launched at competitive price tag of approx Rs 1.4 Lakh. Until then, we could only wish Aprilia launches it sooner than later.